Matthew VanDyke sitting in the prison cell. Photo Credit: Nouri Fonas. Director Marshall Curry’s Point and Shoot took the Best Documentary Feature award at the Tribeca Film Festival last week — a prize well-deserved not only for spotlighting the story of Matthew VanDyke, a man whose life is steeped in enough drama, action, and tragedy to put the most outlandish work of fiction to shame, but in providing a platform to view a chapter from the Arab Spring from beyond the headlines. VanDyke’s story began in 2006, when the soft-spoken young man with obsessive compulsive disorder decided to start out on a 30,000-mile journey across the Middle East and North Africa. Together with his camera, a motorcycle, and the desire for what he called a “crash course in manhood,” Point and Shoot was crafted from VanDyke’s hundreds of hours of footage touring the region, working as an embedded journalist in Iraq and Afghanistan, and then fighting as a revolutionary against Gaddafi’s forces in Libya. Curry, director of two Academy Award-nominated documentary features Street Fight and If a Tree Falls, took on the project, fashioning the footage in the editing room into an intense 82-minute record of a coming-of-age story in the midst of a foreign revolution and the pits of a Libyan state prison. Though the film’s subject matter contends with death, war, and imprisonment, Curry is never heavy-handed with those scenes, and is triumphant in expertly balancing the more difficult footage with examples of the lightheartedness that serve to flesh out the documentary further. The audience comes away with a better understanding of VanDyke as well as the people around him, most notably the camaraderie that exists between the revolutionaries, through memorable scenes like that of being welcomed into the fray by a jovial group of his buddies singing and dancing. These moments of warmth are especially important in capturing the feeling of belonging and friendship, since one of the main catalysts of VanDyke’s reentry into Libya for the sake of revolution was coming to the aid of the friends he made while on his motorcycle journey. Armed with a gun, in addition to his camera, VanDyke became a revolutionary, fighting and carrying out missions with his unit. 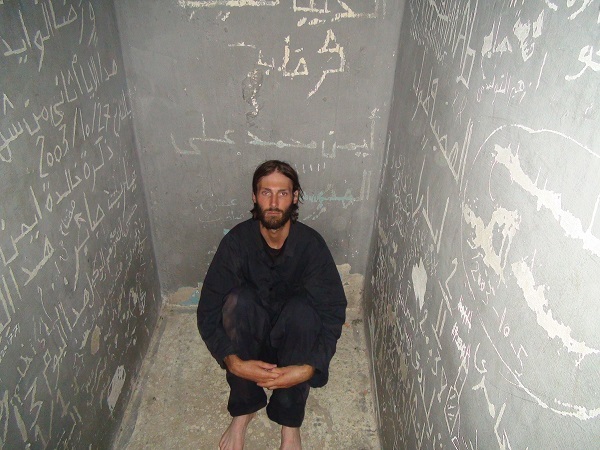 After an ambush, during which he was captured, he woke up in a prison to the sounds of a man being tortured in a room above, his camera confiscated. Point and Shoot compensates for the lack of footage of the confinement by employing the use of animations from his perspective of the small cement confines, utilizing hand-drawn cell animations layered over a 3-D model of the prison. After returning to the United States, VanDyke compiled some of the footage and sought a director to help him present his story to the world. Today, he works to support the revolutionaries in Syria, and has put together a 15-minute documentary called Not Anymore: A Story of Revolution to illuminate the cause. As for Point and Shoot, he hopes to present the film in an upcoming Libyan film festival, and have it translated into Arabic. GALO was present at the Tribeca Film Festival’s world premiere of Point and Shoot, and interviewed both VanDyke and Curry ahead of the film’s win of one of the top jury prizes. GALO: Marshall, what did you think when Matt approached you with his story and footage? Had you heard about his story on the news? Marshall Curry: I hadn’t, actually. So when he e-mailed me, it was the first I’d heard of it. But he came to New York and he and Lauren met with my wife and I, who is also my producing partner on the project, and they told us the story and it was unbelievable. It was sort of a no-brainer that it was something I’d like to get involved in. GALO: There must have been quite a lot of footage. Matt, how much of it had you watched over before reaching out to Marshall? What was the process like of actually piecing together the story from the footage, and how much did you both collaborate on that? Mattew VanDyke: I don’t know how much of it I really watched. I catalogued some of the footage, but I had probably a couple hundred hours that I hadn’t catalogued at all through the years. There were a lot of tapes; it was quite a bit, which is why I couldn’t do the project myself. MC: So the way that it worked was, after we agreed to do it and he sent us the footage, we started going through it and we came up with questions based on just viewing the footage and on the long conversation that Matt, Lauren, Elizabeth, and I had before. He had spent a number of hours telling us the story, so we already knew the basic outline. When we watched the footage, it created some more questions. So then, we went down to Baltimore with a cameraman and shot interviews over the course of two days, and then went back to New York and started editing. We edited for nine months or so, and over the course of that, it created even more questions. We did audio interviews with Matt, where we would ask him to just explain in more detail and then — I’m sorry, what Matt? MV: Well, when I brought you the footage, I stitched together a kind of 50-minute, very rough film that just covered the basic story and samples of what footage was in there, just from the Libya part. It was something I had turned together in about a week for family and friends mostly, and then I was reaching out to directors to try and find the right person for this job. GALO: Was there anything specific you wanted to include but couldn’t because of time constraints? MC: Sure, it’s a huge story; there are hundreds of hours of footage. Just our interviews alone were 20 something hours. Matt’s childhood, we probably talked about it for two and a half hours, and we boiled it down to a 60 second music montage. We would love to have made a 10 hour series — and I know there is enough footage and enough drama in the story that we could have done that — but unfortunately, PBS doesn’t run a 10 hour series unless your name is Ken Burns, so we had 80 something minutes. We had to just boil it down to the base. They’ll probably be DVD extras, and I know Matt has been thinking a lot about developing a TV show or putting out some more of the footage.